Except, that is, another galaxy. 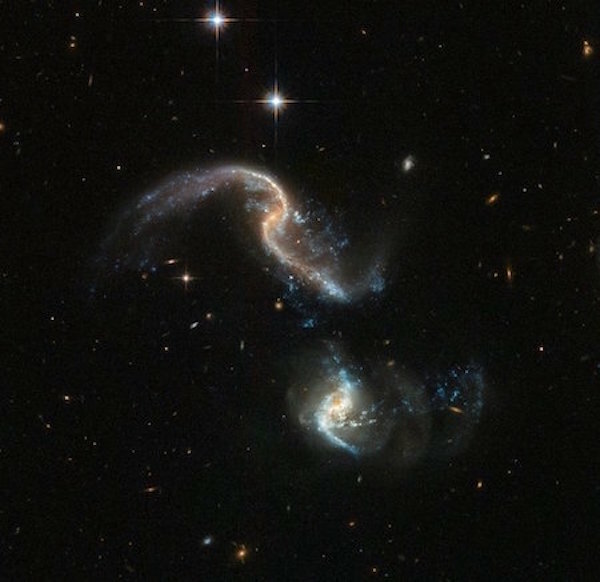 Galaxies orbit millions of light-years apart, but gravity, the immutable magnet of the cosmos, can pull them together, producing spectacular collisions that reshuffle stars. According to the leading theory, the Milky Way will collide with one of its closest neighbors, Andromeda, sometime between 6 billion and 8 billion years from now. “The collision between our galaxy and the [Large Magellanic Cloud] takes place in the majority of cases—over 93 percent,” Cautun says. The collision would be a slow showdown, unfolding over the course of billions of years. Stars from the Large Magellanic Cloud would ricochet like pinballs, dislodging some of the Milky Way’s stars from their orbits. Our galaxy as a whole would survive, but some stars may be flung right out of the Milky Way, Cautun says. Meanwhile, the sleeping, supermassive black hole at the center of the Milky Way would wake up. Like volcanoes, black holes alternate between peaceful dormancy and ferocious activity, depending on the surrounding conditions. Ours is in a quiet period. But the chaos of the merger would send cosmic gas swirling toward it, and cosmic gas is dinner to black holes. The resulting feast is a spectacular show. A disk of luminous, hot cosmic material swirls around the black hole at great speed, and bursts of high-energy radiation erupt from its center. Cautun says one serving of a Large Magellanic Cloud could lead our black hole to gobble up enough material to grow 10 times its current size. And what would happen to us, if there is any kind of “us”—life in some form—on Earth when this all goes down?